Xobni has been revolutionizing Outlook inboxes for four years with its Outlook add-in that shows everything you could possibly want to know about a contact. Using nothing more than an email address and your own logins to social media networks, Xobni pulls in data from social media platforms until the only thing you don't know about the person who emailed you is their blood type. This functionality has been partially ported to its new Smartr Contacts app for Android, which was previously known as Xobni for Android, and fully ported to its new Smartr Inbox for Gmail. Both are currently free and just launched in public beta versions. Privacy watchdogs may be put off by the fact that Smartr wants your LinkedIn, Facebook, Twitter, and Google Account information. There's no conspiracy here, but rather the capability to pull together all of your interactions with one contact across various social platforms. Want to see a picture of that client who emailed for a quote? If they have a portrait on any of those social media profiles, you will. Want to know what your boss was tweeting about during yesterday's meeting? Pull it up in Smartr Contacts, and you may see everything else she was talking about on LinkedIn and Facebook. A vast improvement over Xobni's Outlook product, Smartr Inbox for Gmail may have just eliminated the need to use Microsoft's email program at all. While it may take time for Smartr to index your Google Account if you have a lot of correspondence, the wait is worth it. Xobni's tool for Gmail even outshines its Outlook counterpart. With Smartr for Gmail installed, you can see all of the information about a contact at the right-hand side of your screen when they email you. 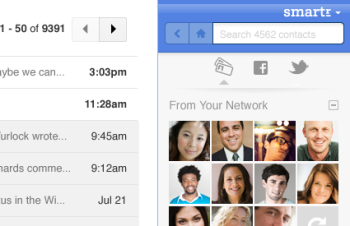 This eliminates the need to hunt for phone numbers or open another browser tab to check someone's LinkedIn profile. With Xobni's Autosuggest feature, just type the first few letters of a contact's name in the "To" line of a new email to bring up a contact's email address, picture, and other information. Once you've selected your contact, Xobni intuits the next most likely people you'll want to add to your message, based on past correspondence. You can download and install Smartr Inbox for Gmail here. Xobni's Smartr Contacts for Android still allows you to find out everything you could possibly want to know about everyone on your contact list that they've decided to make public, but it's limited. It's just your contact list--imported from Facebook, LinkedIn, Twitter and all of your Google Accounts--and it's an excellent replacement for the Android contact manager. I've already started hitting Smartr on my home screen instead of Phone to bring up contacts after using the application for just a few hours. When you open a contact, you can either see their details, their social profiles, your correspondence history, or contacts that you have in common. You can then call, email, or text your contacts directly from Smartr. When you edit contacts on any of your Xobni applications, your contacts will update on all platforms. Unlike its Gmail counterpart, where you can see all of your past correspondence and pull up old emails, Smartr for Android can't open older emails, just their subject lines. Hopefully Xobni will marry the two applications so you can pull up historical emails from your phone. You can get Smartr Contacts for Android here, or look for "Smartr" on the Android Marketplace. Smartr is coming soon for the iPhone, and it will be interesting to see how it compares to the services available with Apple iCloud. You can sign up for the private iPhone beta, test version, here. Both applications had a bit of a laborious setup process, as you'd expect for an application that effectively indexes both your personal and business life. You need to enter passwords for each account and authorize Xobni to access your data. This is only inconvenient to those looking for a one-touch install, and is completely worth it for the benefits that you and your employees will see from either application.